Late sightings of lions in North Africa may seem surprising and certainly some of the stories have oddities about them (Black et al. 2013). What should not be forgotten, however, is how distinguishable a lion is from other similar species in the region – the chances of people mis-identifying a lion are relatively slim. Even among the most recent sightings of Barbary lions in Morocco and Algeria the variation of circumstances when people see the animal is huge – for example one sighting is a photograph taken while flying over the Atlas mountains, another is lion observed by locals on a bus, whilst several others occur when the animal was shot (Lee et al. 2015). Assessment of historical sightings by expert panel reveled the reliability of these sightings is generally high, so varied sources can be sensibly used to map out the story of the species’ decline. 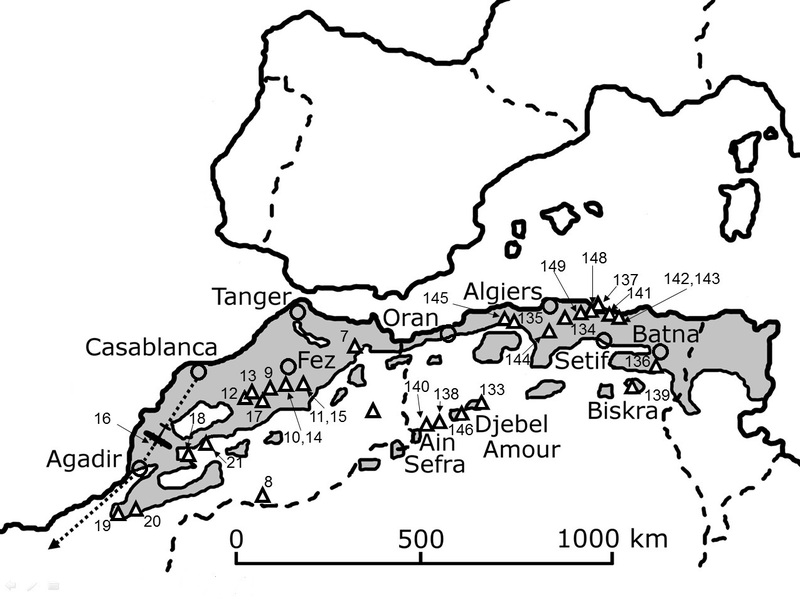 Observations of lions in North Africa 1895 – 1960 Grey shading indicates Mediterranean scrub land. Triangular markers indicate lion sightings; (sightings 7–21) in Morocco (western Maghreb) and sightings 133-149 in Algeria (eastern Maghreb). Black circles denote human population centers. Dashed lines indicate national boundaries. This entry was posted in Extinction, History and tagged Algeria, barbary, lion, Morocco on September 4, 2015 by Simon Black. This is the big question! Do pure Barbary lions exist? First it is difficult to know what a pure Barbary lion is (i.e. using genetic information) since there are only small fragments of DNA extracted from a very small number of museum specimens (150 – 200 year old minimum). Any comparisons to modern lions can only be made with these tiny fragments and they only identify the maternal relatedness. This means even hybrid lions might not be detected as having ‘Barbary genes’. Theoretically if we knew the level of hybridisation in individual animals we could breed back to a reasonably pure Barbary lion. The science needs to catch up. At this stage it is our best assumptions to keep the animals known to be descendents of the King of Morocco’s collection separate form other lions, until we have the technology and will to manage specific selective breeding programme. Simon Black pure barbary lions really exist? I see that many people have doubts about it.